With the strengthening rumor that Alonso has agreed to go to Ferrari next year, with Massa off to Toyota, talk surrounds a replacement for McLaren. Even if the Ferrari story is untrue, it seems inevitable that Alonso will leave his present team and so the talk is not entirely wasted. Many are saying that Nico Rosberg would be ideal for the job. While this may be true, it does not necessarily mean that he wants it; Nico has been singing the praises of the 2008 Williams recently and is clearly looking forward to driving it. That does not sound like the words of a man about to change teams. Frank Williams has also been talking highly of his young driver and, although it was tempting to assume that this was to drive up the price for any team interested, it looks increasingly as though Frank actually means what he says. Coming from a man who is renowned for regarding drivers as replaceable components, that is high praise indeed. So Nico would be a good choice but I doubt that he is avalable. 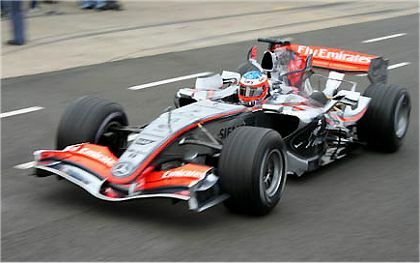 Second favoite in the forums is Jenson Button but there are problems where he is concerned too. For a start, Honda have just announced yet again that they are sticking with their driver pairing for 2008. Would they be doing this if there was any chance that Button was about to break his contract and leave? And why would Ron Dennis be willing to take a risk on a driver whose contribution to a previous silly season was a long wrangle between Honda and Williams? Ron has had enough of driver problems for the moment, I think. So who else is there? It has to be someone who can drive the car well enough to keep Hamilton in sight at least but not a prima donna who is going to be complaining about treatment all the time. Presumably we can forget about Ralf in that case. Fisichella? Once again, I think Ron would recoil from any more Briatore proteges. What about de la Rosa then, the good old standby? Except that Pedro has blotted his copybook over the emails thing; Ron may not be one to hold a grudge but he is unlikely to see de la Rosa's involvement as deserving of a reward like a race seat. But McLaren has another test driver, one who has not been mentioned at all in connection with the recent scandal and who has the reputation of being very, very fast. Gary Paffett is the man with the best chance of the second McLaren seat and what's more, he deserves it. Although not a McLaren product in quite the same way as Hamilton is, Gary has been a McLaren driver for quite some time now, winning championships in other formulae while he awaits entry to the team. Ron has had a very happy experience of bringing a completely new driver into F1 and he may well wish to repeat the experiment. In Gary, he is likely to be just as well repaid, for his record is similar to Hamilton's, as I have pointed out before. Add to that the fact that Ron may not wish to pay superstar wages after the FIA fine and the necessary upward hike in Hamilton's pay, and Gary becomes even more a tempting prospect. It is really the perfect solution. No more trying to satisfy the demands of an overpaid F1 star, no more arguments about who is getting preferential treatment; Paffett would be happy with whatever he could get and be grateful, I'm sure. Hamilton would be free to pursue his dreams of championships and Gary would be under no pressure to equal his performances, at least in the first year. Which is not to say that he wouldn't be as quick as Lewis; I think he would be. So, if you're looking for advice, Ron, take mine and hire Gary now. Apart from anything else, it would take the wind out of an awful lot of fanciful speculation regarding the second seat. I'm not convinced Paffett is fast enough. I could be wrong, but Ron ought to know one way or the other. I'm sure either Button or Rosberg could be prised away if Ron has enough money, but after the £50m fine, money is not perhaps in great supply at Mclaren. Fisichella would be a safe pair of hands - and probably cheap as he'll doubtless be shown the door at Renault - but he too is not really quick enough - and from what I've heard he's not a great technical guy either. Trulli wouldn't be such a bad bet, but what with his remarks about Mclaren getting off lightly, I doubt he's their favourite person, and in any case, he's tied into Toyota on a long term contract. Massa too, could be an option if Alonso goes to Mclaren, but would Ron really want one of Nicolas Todt's proteges? If I was Ron, and feeling brave, I'd snap up Adrian Sutil. OK, so he's a little rough around the edges, but he looks seriously quick, and Hamilton has already shown that he has the maturity to lead the team, and Dennis need not fear pairing him with a youngster. Plus, apparently, the two of them get on, despite having been team mates before. And two drivers who get on might be something that appeals down at Mclaren right now. All good sense, Patrick, but I want to see how fast Paffett really is! There were some who said that he should have got the second McLaren at the beginning of this year, rather than Hamilton, so there are those who rate him at least. Plus he's done the apprenticeship as a test driver - time he was given a chance. I dont know that The Ham has the technical experience to set up the car quite yet. Paffet seems like he would be good in this role. Agreed, Dan, and it all combines to make Paffett the logical candidate for Alonso's seat. Ron would not have to alter his policy of not having a stated #1 driver but, if that's the way it turns out, it will make life easier for everyone concerned. I'd say the ONLY solution, most of the article questioned if so-and-so was right for the position, but I question how many drivers really want to play second fiddle to Hammy. Maybe those about to get pushed out of F1; Ralf, maybe Fisi, but few in their right mind would ASK for the second McLaren seat. De La Rosa SHOULD have had the second seat this year, De La Rosa SHOULD get it next year but Paffet will get it and McLaren will surely drop from top contention. Dan M has brought up a good issue, Hammy hasn't the technical experience yet to set up a car and neither has Paffet! Fisi, Trulli, I'd sign them in a flash, they're not bad drivers just drivers stuck in bad cars. Others hiding in the shadows.....Christian Klien and Franck Montagny. They've got the EXPERIENCE that Paffet hasn't. De la Rosa is my bet (choice). He has the car setup experience, and if the transcripts show nothing else, they surely show the extent of his involvement and technical knowledge in the engineering and car developement. Paffet would be a good sub for McLaren next year, and if he showed his speed to be superior to Pedro's during testing, they could still make the switch (as long as they ensured it was in both their contracts) during the season. Pedro showed his stuff in his race drives for Montoya last year, and was pretty darned impressive. Points in almost every race. Fisi and Trulli have always had good spin (i.e. press spin), but really, they haven't shown us anything special. If McLaren want next year's constructor's, they will have to put in a pretty strong and consitent driver. Mentioning Ralf is a bit of a joke - he's lucky he's had such a long career, and certainly it was only on the coat-tails of his brother. I suspect he will go to DTM for a couple of years until they tire of him there as well. I can't see McLaren putting de la Rosa in the second McLaren regardless of how good he is, purely because of his role in the spy scandal. They want everyone to forget the whole thing as soon as possible and Pedro can only be a constant reminder as long as he remains visible. As for Paffett's set-up abilities, reputation says he can and I think he deserves a shot at it, at least. But Number 38 is right that few drivers will be all that keen to take on Hamilton in what has become "his" team. If Alonso leaves and Hamilton stays then it will only reinforce the belief that Hamilton is the top dog in McLaren's eyes and can only put prospective drivers off making the switch there. Button surely can't break another contract can he? It would be par for the course if he tried though. Perhaps it will be Massa who remains at Ferrari, given his Schumacher and Todt connections, and Kimi will switch back to McLaren. Just need to wait and see - one thing we should've learnt by now is that it's hard to secondguess these things! I still don't get why Pedro would have any blame or be tarnished with the scandal - as one article I read talked about how he is probably the most honest driver on the grid. His part in it was quite innocent, in that he thought that Coughlan simply got bits of info from his buddy on another team, much like many engineers that have worked together at one point still remain friends and trade little secrets here and there. If Ron is so rightious like it has been said so many times here, he certainly wouldn't hold anything like that against Pedro for him not knowing the extent of Coughlan's information on Ferrari. Massa may well remain at Ferrari, but Alonzo will most certainly be gone, more likely back to Renault. Opening the door for Fisi is a long shot, otherwise there aren't many current drivers to choose from. If Ron isn't going to choose a current driver, he'd be better off promoting his OWN tester than bringing in a tester from another team or someone from another series. It's too bad Ron didn't see Bourdais' worth sooner, I'm surprised he wasn't snatched up a couple of years ago from CART. Now Torro Rosso has him (hmmm, or DO they? Money talks after all). I think it's all about perception, Scott. I agree that Pedro had no idea of the extent of Coughlan's involvement with Stepney and probably thought the info came from the normal inter-engineer chitchat, but that is not how most perceive it, including the FIA, since they inferred that the info must have gone deeper into the company than that. Whether it is fair or not, Pedro is tainted in the public eye as a result. Ron would not hold that against him but his first concern must be that McLaren recover a squeaky-clean image - and part of that will have to be that anyone remotely connected with the affair be quietly pushed into the background. It just makes public relations sense. Personally, I wouldn't take a chance on Bourdais. Let him prove himself with Toro Rosso and then get a good drive with another team. It's not McLaren's style to take a risk on an untried driver - and, as far as F1 is concerned, Bourdais is untried. There's also Jamie Green. He's under Mercedes' wing, and was faster than Lewis when they both first tested with McLaren. He just won his first DTM race and has been consistently fast there. Actually, personally I think Paffett is perfect for the job. Green sounds good - how did he slip beneath my radar? But I think McLaren would prefer to go with what they know and that means Paffett. Clive is pushing for Paffet, Scott and I would rather see De La Rosa, but I think Clive will get his wish. Now my friend has previously stated Mr. Dennis in NOT vindictive and if so then De La Rosa should NOT be "tainted". He wasn't knowingly involved with the Ferrari data. 1.Scott Speed comes back. This would make Ron a laughing stock.... until Speed showed his true.... speed. 2.Being that Alonso is still under contract and HAS to be a #1, why not a direct swap for Hekki, and keep Fisi as his second in command, it worked the past couple years. 3. As it seems that Todt will be out of a job next year, maybe its possible that Massa will be driving a silver car next year. Him and The Ham seem to get on quite well. Now they can (legally) get some Ferrari info. Too bad this post is a couple days old, curious to see what people make of these moves. I like the Scott Speed idea, Dan, but can't see Ron going for it. He's really quite conservative when it comes to drivers and taking Speed on would be a bit of a gamble. The Heikki/Alonso swap also makes a lot of sense to me but again I think Ron wouldn't go for it (although I'm sure Flavio would put his own grandmother in with the package if it would guarantee he gets Alonso).